You can make this up to 3 days in advance. You can also and freeze this to enjoy it later. 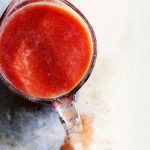 Blend the tomatoes in a blender until smooth. Run the mixture through a sieve, and then add in the cup of water. Next add in the Old Bay seasoning, horseradish, lemon juice, lime juice, salt and pepper. Whisk together until combined. Refrigerate to chill and set for 30 minutes.